Located on the second floor, this room has its own private balcony that overlooks both the Caldera Gulf and a partial view of the volcano. In addition, there is also a window facing east which provides a view of the delightful traditional walking path that is in keeping with this natural location. The bedroom offers the added flexibility of either a queen or twin beds, making this room suitable for couples and friends alike. This room comes complete with a spacious modern bathroom with shower – all newly renovated for 2019. The accommodation also includes a refrigerator and other modern amenities that you would expect from a quality hotel such as ours. For a detailed list of what we offer, please review our Features section. 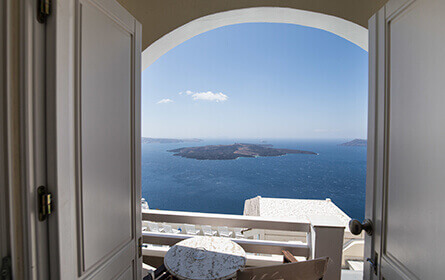 For even more unobstructed views of the beautiful island of Santorini, you only need to walk down to the pool which is easily accessible from this room. Once there, you can enjoy the complete Santorini experience by taking in the breath-taking beauty of the landscape. As well as spectacular views of the Caldera Gulf, volcano, Firostefani village, Akrotiri and Thirasia Island, experiencing the famous Santorini sunset is a memory that will stay with you forever.